Unlike a number of other nations — especially some countries in Europe — the U.S. is currently not dealing with general price declines. However, the risks of such an occurrence have increased materially. 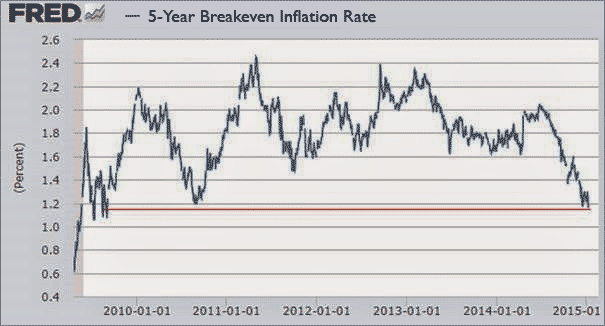 This for example can be seen in the intermediate-term market-based inflation expectations, which have fallen to 2009 levels — when deflation was a serious concern. 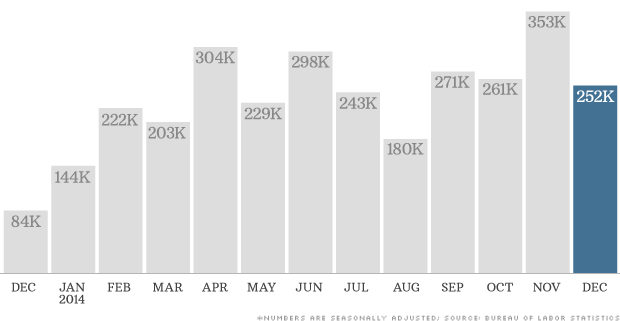 One key data point supporting these rising risks came from last Friday’s jobs report. The report showed wage growth falling from a fairly stable level of 2% per annum. 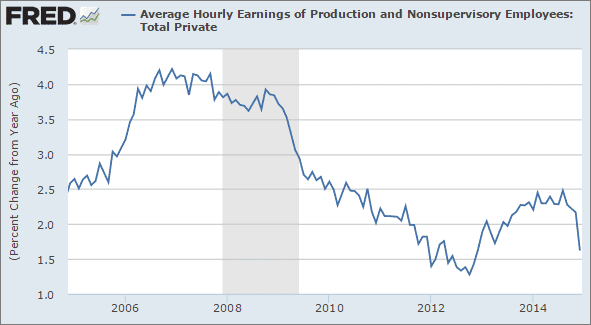 In particular, “production and nonsupervisory employees” saw a sharp decline in wage growth — in spite of robust growth in payrolls (see chart). Economists have been expecting the recent strength in U.S. labor markets, including big increases in job openings (see chart), to translate into stronger wages. However, just the opposite has taken place. 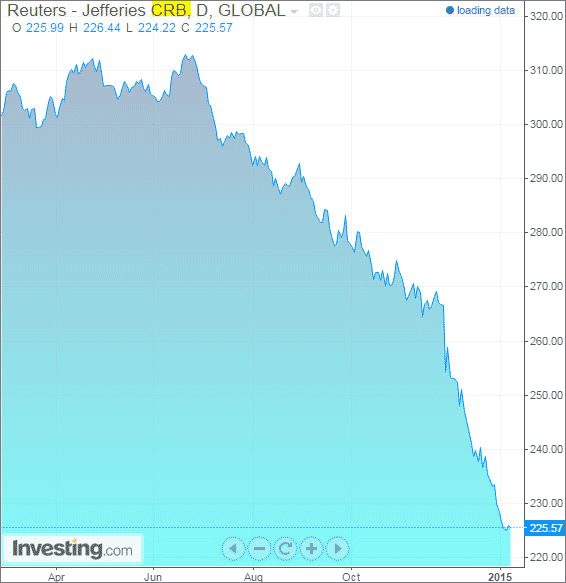 Now, combine slowing wage growth with global disinflationary pressures and the collapse in energy as well as other commodity prices (see copper price for example). Below is the CRB commodity index. Plus, as an additional data point, the PriceStats CPI trend (online-price-based CPI-tracking model) has fallen to 2009 levels. 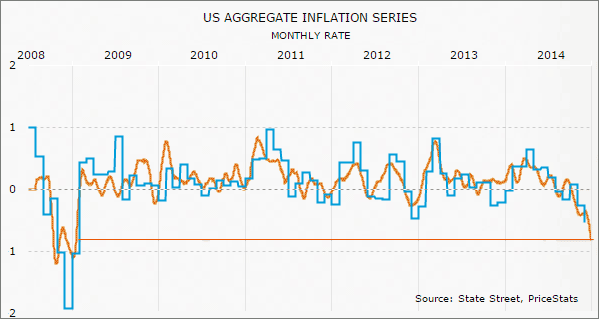 Putting it all together points to rising risks of deflation in the U.S.. 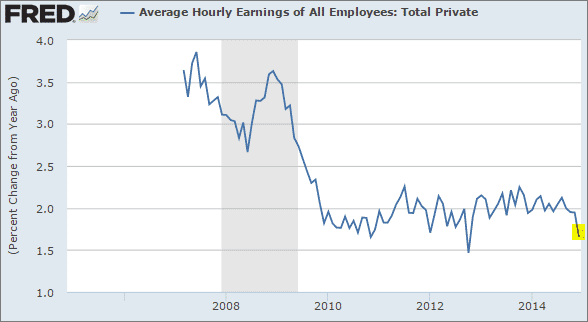 There is absolutely no way the Fed can raise rates in this environment. In fact some Fed officials are quite open about taking any 2015 rate hikes off the table. Nevertheless, the markets still anticipate the first hike in late Q3/early Q4 of this year. This is somewhat surprising, considering that in the U.K., for example, rate hike expectations have been shifted to 2016 (see chart). 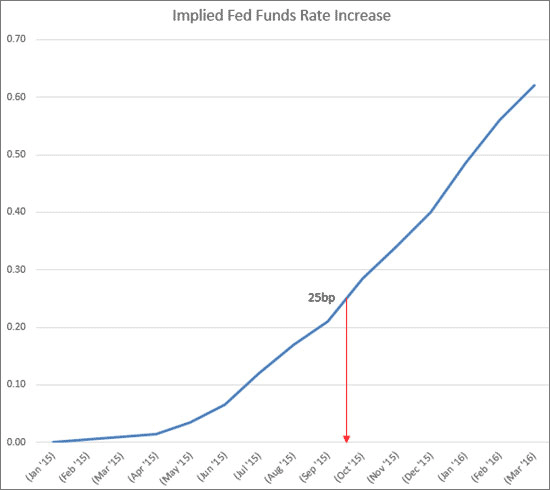 It's not that a 25-50bp Fed Funds rate hike by itself will have much of an impact on the U.S. economy. In fact short-term rates actually rose at the end of last year without most people even noticing (see post). Raising short-term rates in the U.S. (while the rest of the world is on hold or lowering rates) risks pushing the dollar higher. And a much stronger dollar would exacerbate some of the trends discussed above, increasing the possibility of deflation in the U.S..